"Little" Yao Ming had a dream when he attended the Gao'anlu No 1 elementary school in his home city of Shanghai -- to bear or raise the national flag at the weekly flag-raising ceremony on school campus. More than 10 years after he left the school, Yao, now a towering 2.26-metre basketball superstar in the NBA, had his dream come true as the Chinese Olympic delegation announced on Monday he would be the flag bearer of China at the 2004 Athens Games. "I am very excited, it's a long dream come true," Yao said yesterday upon arrival at the Athens airport with the Chinese men's basketball team from Lithuania. The flag bearer and raiser in school were chosen by teachers, to whom Yao was not a favorite. "I waited for five whole years as an elementary school student, but I was never picked," Yao said. "I hate that teacher! No, no, no, just kidding, just kidding," he quipped. "Seriously, the teacher's decisions were understandable," Yao said. "My academic performance was so-so and I was quite ordinary in every aspect at that time." "Ordinary" is not often used to describe Yao these days. Becoming the first NBA top draft pick without American background in 2002, Yao has developed into a star with an international following after two years with the Houston Rockets. The 23-year-old has won the starting All-Star centre position two straight years over Shaquille O'Neal and helped the Rockets reach the play-offs in his second NBA season. His good image on and off the court and popularity all over the world made him the favorite to carry the flag for the Chinese delegation. "Yao is very tall and represents positive image for Chinese athletes, " said Xiao Tian, secretary general of the Chinese delegation. "He played very well in the NBA and enjoyed a good image both on and out of the court." "He is a man of integrity and has good sense of humor," Xiao said. "He is the perfect flag bearer." Although looking forward to this "historic day" in his life, Yao felt sorry that he would have no companions when bearing the flag. "I thought there would be some supportive bearers going with me, that would be cool, but seems I will be on my own," he said. Yao would also like to have some time off to well prepare for the "big" ceremony, but that was not allowed by his American coach Del Harris. 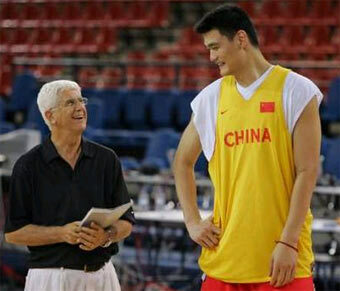 Harris, the first international coach in the Chinese men's team in history, shook his head with a smile when asked about a possible break for Yao. 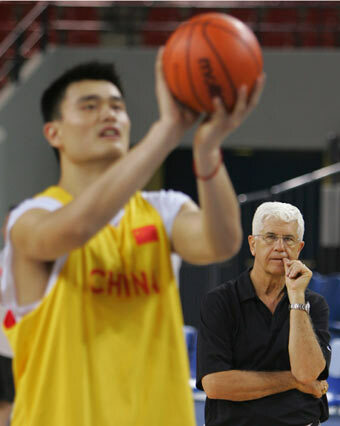 Less than three hours after his arrival at the Athletes' Village, Yao went to the Helliniko Olympic Complex to train with the team. Anyways, Yao's dream will come true when he wakes up on Friday.